Super Bowl Sunday is BACK! 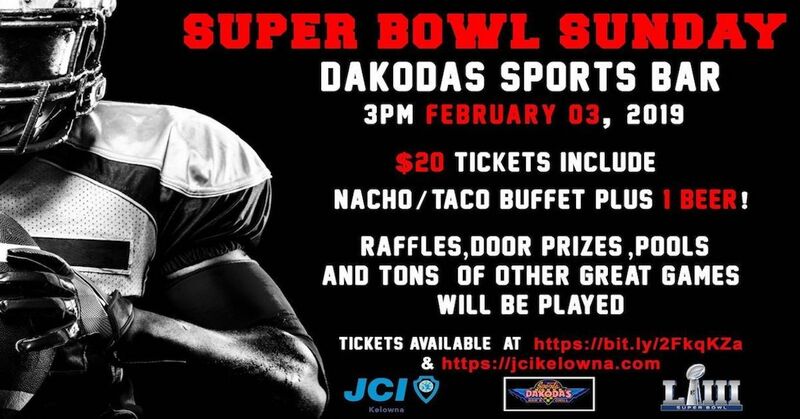 Join us at the Dakoda’s Sports Bar and Grill on Sunday, February 3rd at 3pm to cheer on your favorite team at the JCI Kelowna Super Bowl Party. TICKETS: $20 Tickets are on sale LIVE which will include a delicious all-you-can-eat nacho and taco buffet, plus 1 beer! Grab your friends and join us for food, drinks, awesome commercials, a halftime show, and oh yeah, someone said something about a football game. There will be a ton of great door prizes, pools, raffles, games and much more so get ready to WIN! Can’t wait to see everyone out on the 3rd!